While it may not necessarily be a household name, Raycom Media touches millions of lives across the United States, owning or providing services for over 60 television stations and two radio stations within 44 markets. Based in Montgomery, Alabama, it is also the parent company of multiple subsidiaries that deliver community newspapers, sports marketing, events management, sports and entertainment, and much more. In its quest to produce best-in-class locally relevant content, deliver great content to communities across the US, and engage users across all platforms and media, Raycom strives to maintain an aggressive and viewer-focused social media and content strategy. This is particularly evident at KLTV, a digital channel and ABC-affiliated television station with reach across communities in and around Tyler, Texas. While KLTV has robust social presence and viewer engagement today, a few years ago management in the newsroom realized they needed different ways to create engagement between their audience and talent at the station. Specifically, the station sought to grow Twitter followers for reporters and anchors. They were looking for tools to help them increase engagement throughout the website and mobile app. However, they didn’t want to accomplish this in standard ways, according to Ashley Slayton, KLTV’s Digital Content Manager. But, as anyone who has tried to build a follower base and cultivate engagement through social channels and across content platforms knows, this is no easy feat. It takes a combination of smart content curation, a comprehensive social media and content strategy, and a spectrum of supporting tools and platforms to attract, engage, and retain a committed audience. Further, Raycom faced the challenge of managing content across a large variety of apps and social media accounts. In addition to three niche apps, KLTV also has one weather app, an Amazon Fire and Roku app. The station recently released an all-day, all-local digital news program that runs on their over-the-top (OTT) apps, dot com sites and mobile apps. On the social front, KLTV has nine shared Facebook accounts, four Instagram accounts, six Twitter accounts, and one Snapchat account. This all with a relatively lean team of web producers charged with managing the channels. The newsroom has a digital first culture and the web team has an overriding commitment to deliver to and engage users. “We have somewhat of a philosophy that we want to be everywhere the viewers are, and so social is a big thing for us,” Slayton explains. But to deliver content across this array of channels and platforms, KLTV needed a tool to push and pull content to and from its various sources and delivery paths. To achieve a highly active social presence, while curating and sharing a considerable volume of content, Raycom started leveraging ScribbleLive Engage, a publishing platform that allows companies to easily create, share, and publish content through any content management system (CMS). 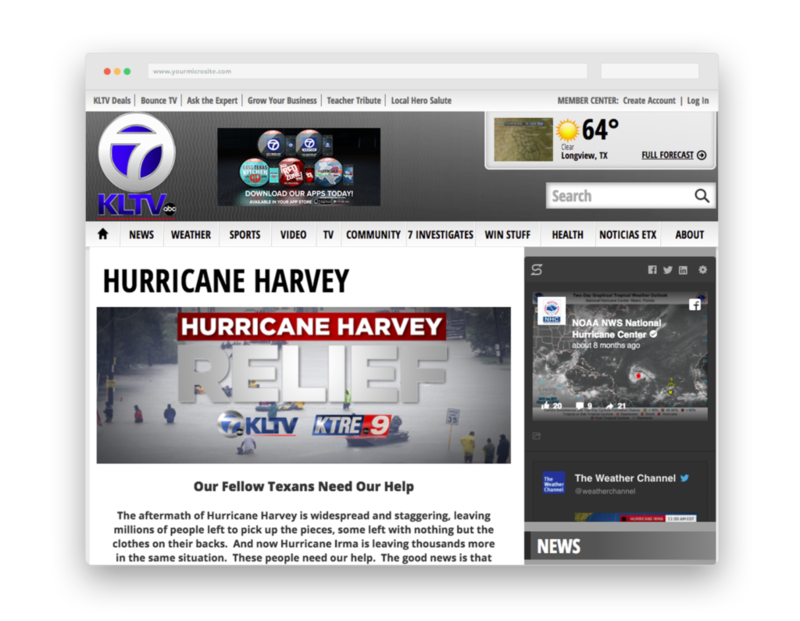 The move allowed KLTV’s web producers to pull content and social posts into live feeds featured across its various properties and also moderate user-generated content. Since then, KLTV has been able to manage content sharing across its various channels and apps seamlessly. KLTV manages 18 hours of live content each day, and Engage plays a prominent role. And Raycom has rolled out ScribbleLive Engage as an solution to dealing with growing social platforms to 40 different local television stations across the Southern United States and Hawaii. It allows the company to essentially automate and streamline all of the small things that they would otherwise need additional headcount to accomplish, thereby saving on costs. Raycom has noticed a considerable uptick in engagement and followers since leveraging Engage to support its social and digital activities. When KLTV has breaking news or a local event, they invite social media users, their own staff and reporters, and individuals related to the event to a central stream that is pushed to viewers for increased visibility. As she alludes, severe weather events are where Engage can really help KLTV shine when it comes to supporting the community. During 2017’s nearby Hurricane Harvey, they generated more than 62,000 pageviews, considerably higher than they would have during other major weather events, in part thanks to Engage’s capacity to pull user-generated content and producer-curated content into one central hub. And by leveraging Engage, Raycom stations have been able to bring more followers into the fold. Learn more about ScribbleLive Engage and develop your content and social strategy by reaching out to one of our content strategists today.